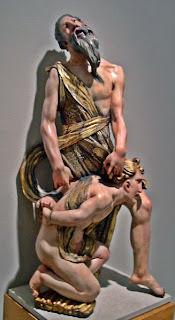 The pagan style of Italian sculpture was not followed in Spain. 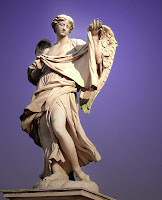 Anything that aimed at the exaltation the human forms in detriment of the expression was refused as something contrary to the Christian sculpture. 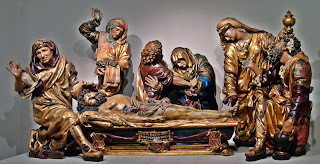 Classical principles are accepted in decorative and funerary sculpture because these were made on commandment but the rest follow the medieval tradition, in which the work depicted some religious ideas, even if disgusting. It is not just a work for decorating altars but an expression of popular devotion. These ideas followed the ideas of Trento’s Council. The favourite material was polychrome wood. When stone, marble or alabaster are used it is in a very scarce proportion respective to wood, that is considered as the ideal material to express devotion. The most commonly used is pine. The artist works in it. Once he finished the work is “white” so his next work is to add the polychrome effects. The image is covered with wax, without eliminating any element of the carving. Over this are applied the colours of the skin and the clothes. For a better depiction of clothes other materials such as golden papers are used. Colours were added afterwards with the quilt technique. The result is a brilliant image that tries to represent popular devotion. At the beginning of 16th century several Italian artist work in Spain (Torrigiano, Fancelli) or Italian works are imported. The most demanded works are tombs made in marble. In Spain artists such as Bartolomé Ordoñez or Diego de Siloé work in some sepulchres that continue, in some way, the Gothic tradition. The two masters of the Spanish Renaissance work in Valladolid: Alonso Berru guete and Juan de Juni. Alonso Berruguete travelled to Italy where he knew the work of Donatello and Michelangelo but in his work dramatist elements dominate over harmony and serenity. In some way he anticipates the Baroque. He is not interested in a perfect depiction but in an intellectual elaboration related to a transcendent idea. Signify dominates over sensuality and beauty. His style is dominated by dynamism, lack of symmetry in the faces and anatomies, non repetition of the images, gestures or attitudes, variety in the study of hands and special interest in the contraposto, creating a much curved image, sometimes helicoidally represented. He expresses anguish, dynamism and drama. He can recourse to establish a hierarchy of images, putting one over another, inverted perspectives. All in all, he renounces to beauty in benefit of the spiritual expression. Among his works we can find: San Sebastian, chairs of the Toledo Cathedral. Juan de Juni has an slow a detailed way of working but his results are magnificent due to their tragic dimension and their brilliant polychrome effects. His images are big, with theatrical gestures. Compositions are too complicated due to the lack of space that announces the Mannerism. He received Michelangelo’s influences. He is not interested in representing physical sufferance, but the spiritual. Images are concentrated, with a bended profile, creating and helix in the space. He finishes the works perfectly, as can be seen in his Piety, Death Christ and Holy Burials.